Try a breakfast dish that will brighten your day. Waffles alone are fabulous for breakfast, but add a sweet and bright compote, and your day will be made. Don’t you love it when beautiful dishes are actually super simple to make? 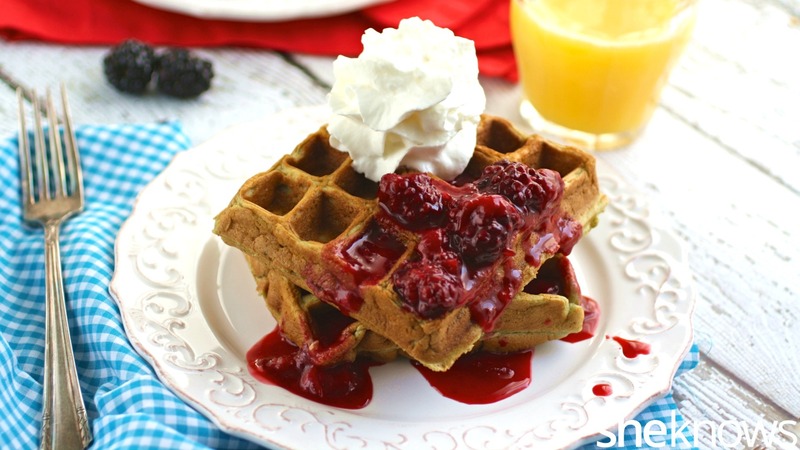 Waffles with strawberry-blackberry compote is definitely one that will impress overnight guests and kids alike. The compote is a nice change of pace from regular syrup, and the berries sweeten the sauce and add great color. What could be more delectable? For the final touch, include your favorite whipped topping dolloped over the waffles. Gluten can be found in many different foods and products, from ketchup to soy sauce to candy and seasonings. While SheKnows tries to ensure that these recipes are gluten-free, carefully read the ingredient labels of all food and food products you use for these recipes to ensure they are also gluten-free. This breakfast dish is filling, and it makes a beautiful presentation. Use your favorite berries for the compote. I matched the yogurt flavor for the waffles (blackberry) to the berries used for the compote. Preheat a waffle iron. Lightly spray the sections with the nonstick cooking spray. To a large bowl, add the flour, brown sugar, baking powder, baking soda and salt, and whisk to combine. To a separate bowl, add the beaten eggs and milk. Whisk to combine. Add the yogurt, and mix until combined. Add the egg mixture to the flour mixture, and stir until smooth. When the waffle iron is hot, add the batter to the waffle sections. Bake until lightly crisp and golden. 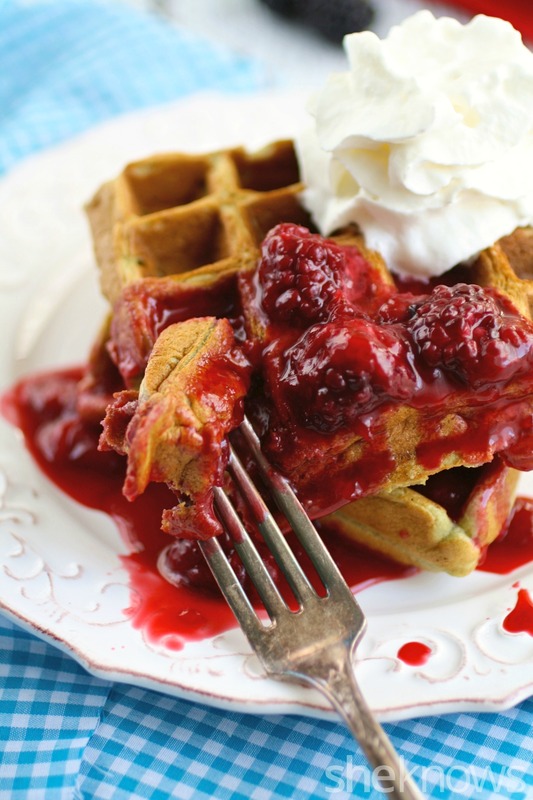 Remove from the waffle iron, and serve warm with the compote. To a saucepan over medium heat, add the orange juice and brown sugar. Bring the mixture to a boil, then add the fruit. Cook the mixture for about 10 minutes or until it thickens. Remove it from the heat, and stir in the vanilla. The compote will thicken a bit as it cools. 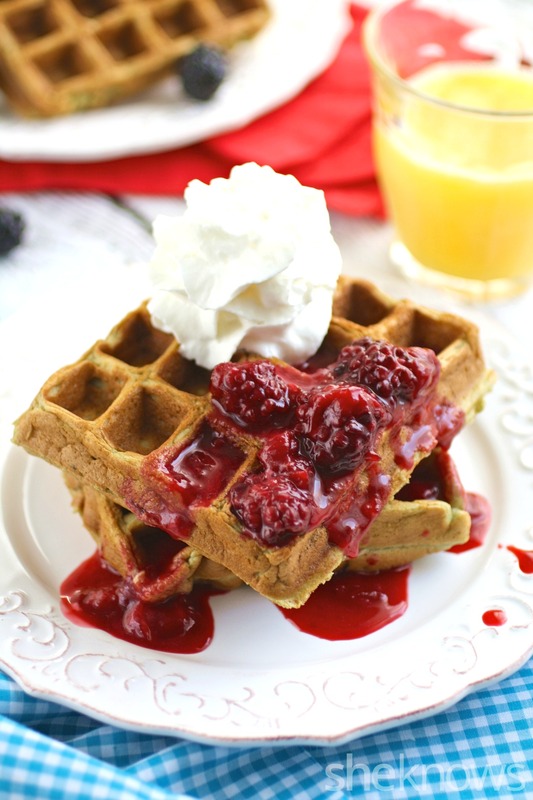 Serve over the warm waffles with whipped topping (optional) and the reserved berries as garnish.